Home / Business World / Lime e-scooters opens first Canadian location with pilot in Waterloo, Ont. Lime e-scooters opens first Canadian location with pilot in Waterloo, Ont. Lime e-scooters rolled into Canada today with the launch of a pilot program in Waterloo, Ont., the first location north of the border for the San Francisco-based company. The electric-powered scooters are making their Canadian debut on a 6.5-kilometre trail route linking the University of Waterloo’s main campus with its adjacent technology park. It’s not Lime’s first time outside of the U.S. The user-pay, sustainable transportation company brought its dockless e-bikes to five European cities in late 2017, then in June debuted its electric scooters in Paris. Lime’s products are distinct from earlier bike-share programs, like Montreal’s BIXI, because they operate without docking stations. Instead, riders use an app that locates the nearest ride using GPS technology and unlocks the bike or scooter. They’ve given birth to a cottage industry of “juicers” who collect the scooters and charge their electric batteries in their homes in exchange for a fee from Lime. Users are required to be at least 18 years old and to have a valid driver’s licence. A detailed user agreement makes them solely responsible for any liabilities arising from accidents with the scooters. The scooters cost $1 to unlock with each use and $.15 per minute to ride in most areas. More Canadian markets to follow? It’s almost certain Lime’s next Canadian roll-outs won’t be in Ontario municipalities, though. In what Probst describes as “a bit of an outdated law,” Ontario’s Highway Traffic Act doesn’t allow the scooters to operate on roadways. The Waterloo pilot has gone ahead because the scooters will be used on a network of private pathways. The company has encountered resistance in some U.S. cities, notably San Francisco, which gave its e-scooter contracts to Lime competitors Scoot and Skip. Some others, including Milwaukee and Denver, have banned e-scooters outright until they can figure out how to respond to things like pedestrian complaints. Probst said the scooters are not intended for use on sidewalks and that “safety is the top concern in this company.” He said users have to go through a tutorial the first time they open the app and that Lime encourages — though cannot enforce — helmet use. Mike Pereira, manager of business development for the University of Waterloo’s David Johnston Research and Technology Park, has worked with Lime and the City of Waterloo to bring the pilot to fruition. He said the tech park and broader Waterloo campus have a good network of paths, but that those trails haven’t always been well connected to places beyond the park. Waterloo has a light-rail transit system launching at or near the end of the year, said Pereira. 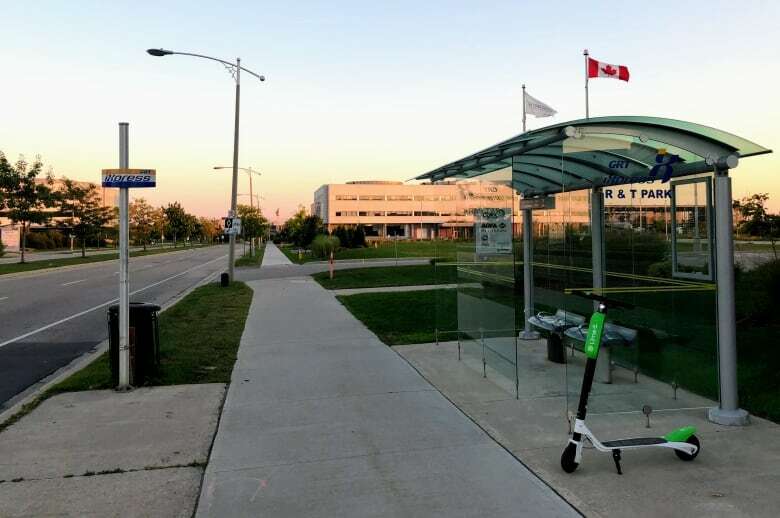 The Lime pilot will help the city evaluate whether active transportation methods such as electric scooters can help people the last stretch from an LRT station to their building, he said. Justin McFadden, executive director of economic development for the City of Waterloo, said his department will go back to city council in August 2019 with a recommendation based on the pilot, which will wrap shortly before that time. As for safety concerns, he said “there’s a risk in anything you do with respect to transportation,” noting that cyclists have accidents as well. Shawn Dillon, Toronto’s manager of cycling infrastructure and programming said the city is monitoring the Waterloo pilot carefully. Concerns include risks to pedestrians who may encounter scooter riders operating at high speeds on sidewalks, and tripping hazards that could arise from parking the scooters anywhere, especially for those with visual impairment. Still, Dillon said there’s tremendous interest in cycling and other active transportation in Canada’s biggest city. “We’re excited to watch how this unfolds and we’ll certainly be reaching out to waterloo to hear from them on how this pilot goes,” he said.